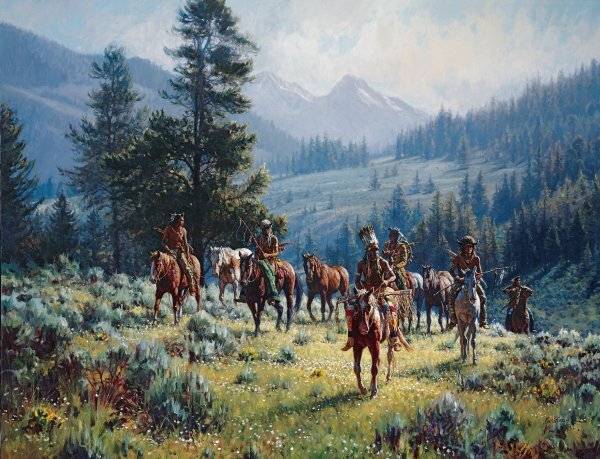 In 2002, Martin Grelle's "Monarchs of the North" won the People's Choice Award at the Cowboy Artists of America Sale and Exhibition at the Phoenix Art Museum. The painting, a 46" x 60" oil on canvas, marked his second major award in that year. Earlier in the year, his "Teller of Tales" garnered the top award at the Prix de West Invitational at the National Cowboy and Western Heritage Museum. Whereas "Teller of Tales" was a close up of three figures, "Monarchs of the North" features many more figures and a dramatic, mountain vista.